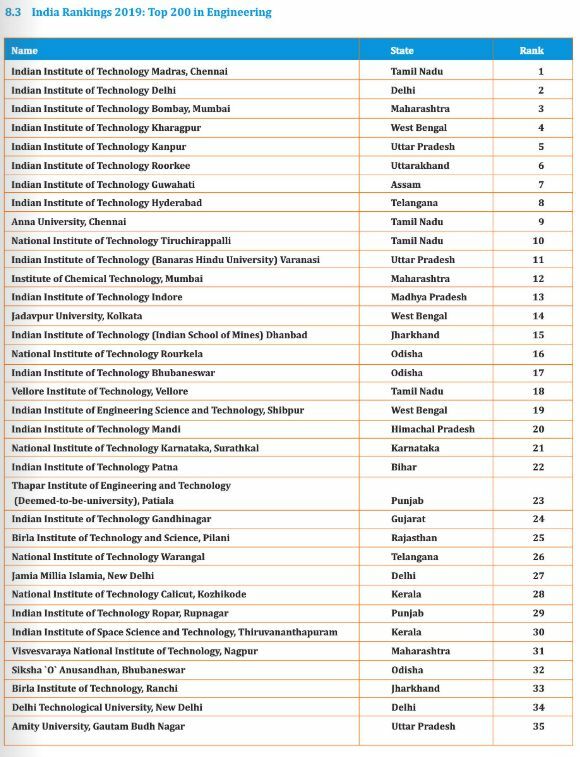 Top 200 Engineering Colleges in India: The Ministry of Human Resource Development is happy to announce India Rankings 2019. We are indeed grateful to the Honourable President of India, Shri Ram Nath Kovind, foragreeing to release the India Rankings 2019. This is the fourth consecutive edition of India Rankings of the institutions of higher education in India. The National institutional Ranking Framework (NIRF), launched in November 2015 by the MHRD, is being used for this edition as well as for the last three editions of India Rankings released for the years 2016,2017 and 2018. Unlike other rankings in the popular media, India Rankings deploy objective criteria and metrics with factual data gathered from third party sources as well as from the institutions themselves. Several improvements were effected in data collection formats, metrics and comparison methodology used for India Rankings over the years. India Rankings 2019 continues with the consolidation process building upon the existing NIRF parameters, experience gained over the years and feedback from stakeholders to establish effective benchmarks to assess performance of the Indian academic institutions in the higher education space. Slight changes in metrics, parameters and normalization algorithms were introduced, while keeping the basic framework intact. As a result, the ranking of Institutions are largely consistent with the previous years’ results, although Individual ranks might have changed by a few spots in some cases due to performance variations across institutions on some parameters. India Rankings is successful in identifying top institutions of higher education in ‘Overall, “Universities’ and ‘College” categories as well as domain-specific rankings in Engineering, Management, Pharmacy, Law, Medical and Architecture. The practice of pre-registration of Institutions for NIRF rankings and inviting new institutions for ranking through an open advertisement continued this year also. A total number of 3127 unique institutions responded and offered themselves for ranking under °Overalls, category-specific or domain-specific ranking. In all, 4867 applications for ranldng were made by these3127 uniqueapplicant institutions undervarious categories /domains. The India Rankings has successfully instilled the culture of collection, compilation and curation of data required for ranking of institutions who are now carefully maintaining data pertaining to their faculty, students, placement, infrastructure, expenditure on library and laboratories, etc. This culture is important for institutions themselves since analysis of this data provides the big picture of trends and patterns that can be used for evaluating and streamlining processes, creating efficiencies, and improving overall student experience. Whiieat institutional level, the data and its analytic can help in assessing institutes themselves against internal benchmarks, at the national level, the data can serve as a base for analys is of the status ofhighereducation institutions in the cou ntry. It is important that the credibility that the India Rankings have earned is maintained with careful attention to details. As a matter of practice, 100 institutions are ranked in Overall, University and Colleges categories whereas ranking is kept restricted to only 15 to 75 Institutions In all other domain-specific rankings (Architecture, Pharmacy. Law, Management and Medical) because of reliability of data However, number of Engineering institutions that are ranked this year has been increased from 100 to 200. It may further be noted that all data for ranked institutions is painstakingly verified, inconsistencies, contradictions and outliers are screened and identified, which requires a lot of diligence, patience and tactful handling of Institutions who might feel offended with direct and blunt questions on.